March 23, 2011 – Gulfstream Aerospace second Gulfstream G250 flight test aircraft successfully completed natural icing tests, bringing the large-cabin, mid-range aircraft several steps closer to its certification later this year by the Federal Aviation Administration and the Civil Aviation Authority of Israel. Serial Number (S/N) 2002 left its home base in Israel last month, crossed the Atlantic and landed in Smryna, Tennessee, where it spent several weeks flying to the Great Lakes region to hunt for natural icing conditions aloft. The G250 successfully completed the test points required for certification, including allowing ice to build up on the aircraft’s unprotected surfaces and then verifying the aircraft’s stability and control characteristics, as well as evaluating the ice protection systems and the tolerance of the aircraft after being exposed to icing conditions for 45 minutes. “The G250 performed exceptionally well,” said Pres Henne, senior vice president, Programs, Engineering and Test, Gulfstream. “During one particular flight, the crew encountered icing concentrations in excess of the regulatory design envelope. The aircraft remained in this condition for an equivalent icing exposure time of more than 50 minutes to allow adequate accumulation of ice. Despite the extremely demanding conditions and ice accumulation on all untreated surfaces, the aircraft performed flawlessly." 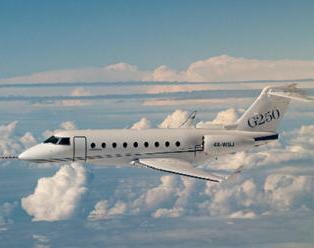 The anti-ice system on the leading edge of the G250 wing was adapted from large-cabin Gulfstream aircraft. Heated bleed air from the engines is routed to the leading edges to prevent ice formation. S/N 2002 will now undergo overnight cold-soak trials, having completed a similar test in Finland. The aircraft has also completed hot-weather testing on the coast of the Red Sea. S/N 2003 has started function and reliability testing in Israel, where the G250 is manufactured in cooperation with Israel Aerospace Industries (IAI). Function and reliability tests demonstrate that the aircraft, its components and its systems consistently operate as expected. Reaching this point is considered a major milestone toward certification. With flight test well under way, manufacturing continues for the first production aircraft, S/N 2004. The empennage and wing have been joined to the fuselage, and installation of the aircraft’s systems has begun. Component-level fatigue testing on the main landing gear and rudder continues, while the full-up fatigue test article, S/N 1999, proceeds with preparation for testing over 40,000 cycles. The three aircraft in the flight-test program have already accrued more than 955 hours in 324 flights. Since 2005 Gulfstream has been working on a follow-up aircraft, the G250, which was launched in 2008, with major improvements, like new glass cockpit and engines, bigger wing, heated leading edges, and other refinements.